It was July 8th 1999. India was taking on Pakistan in the Kargil War. Major D.P. Singh fought bravely, but was severely injured by a mortar fired from other side of the border. He was declared dead at the Army hospital, but another doctor saved him. Singh’s legs were amputated in order to keep him alive. 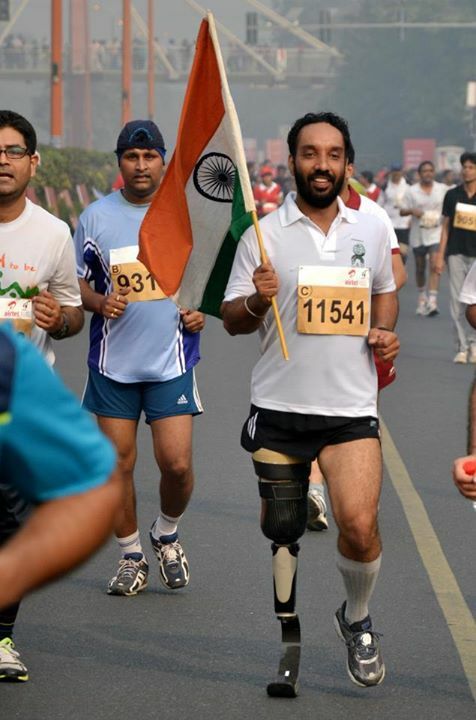 He did not let his disability affect him as he took up running and wanted to be a part of the Delhi Marathon in 2009. That was how long it took for Singh to recover from his injuries. “When I learnt I lost my leg, I told myself that this would be yet another challenge in my life. I just couldn’t get used to the sympathetic glances I used to get from people. After a while, I was desperate to change that,” Singh said. The training schedule of Singh is gruelling. It takes him close to two hours just to get ready and wear the prosthesis. “So to run at 5 am, I wake up at 3”, he says. He initially hopped on his good leg and dragged the prosthetic leg. After months of practise, he was able to hop-run for about five kilometers. Singh was happy with all the hard work he put in. “Sweating out like this after so long elated me. Although it was slow going, but I managed to run two half marathons like this,” he said. The amazing part about the run was that Singh improved his timing by 15 minutes in each attempt. Singh got to know about the fibre blade prosthetic from South African blade runner Oscar Pistorius. He has entered the Limca book of records for being the first Indian to run a half marathon with a blade. He attributes his success to the discipline he recieved in the Indian army. “I owe it all to my upbringing as a Sikh and training in the Indian army, which has given me the ability to convert adversity into opportunity”. His goal is to run a full marathon. “When I was injured, I recieved blood from countless people of different castes, creeds and states. With the blood of India running in my veins, I feel I can do everything”, he concludes. The RRRun. For the heart of Bangalore.